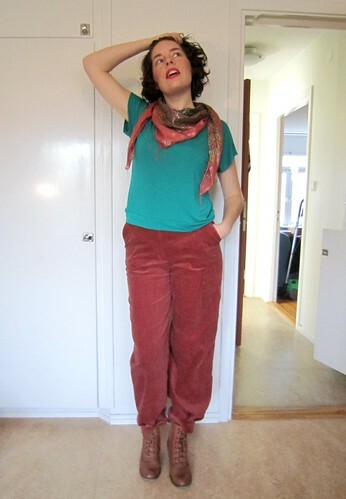 Edit: I had no idea, but a post over at the Coletterie stated that it is Corduroy Appreciation Day today! Fitting, no? 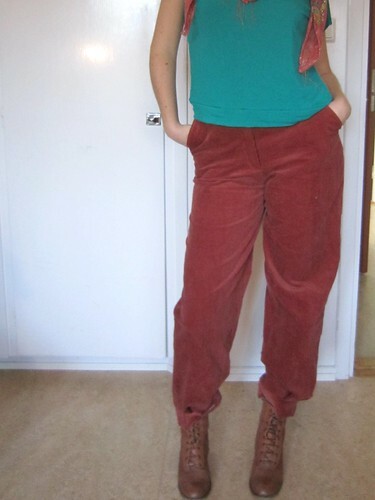 So, I finally finished my corduroy pants! I´ve been wanting to make a rust colored pair since seeing Carolyn´s version. I have already told you about the beginnings of these pants, so here comes the finished product. I used BurdaStyle Magazine 10-2010-110, omitting any back pockets and leather details. Just as for the shorts I made using this pattern, I got good help on zipper insertion from sewing goddess Sandra Betzina in this video over at Threads. On the pictures I wear them with a knit top I made from a scrap of the same fabric I used for the knit dress. 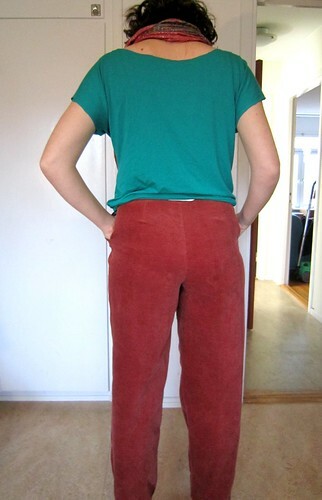 Pattern Description: Flat fronted, mid-rise trousers with faced waist, fly front, slanted hip pockets, back single welt pockets, underlap with button for internal closure, outer tap with button for another waist closure. Did it look like the photo/drawing on the pattern envelope once you were done sewing with it? If I ignore the fact that I did some changes, yes. Were the instructions easy to follow? I didn´t really follow the instructions, as I wasn´t going to have all the details that is included in this pattern. But the instructions seems to be quite thorough, when I look at them in magazine! What did you particularly like or dislike about the pattern? I like the leg finish, and the side pockets. I also love the rise. On second thought I am not too fond of the front fly zipper, but that is only my personal taste, and has nothing to do with the quality of the pattern! Fabric Used: I used a thrifted corduroy fabric. Pattern alterations or any design changes you made: I used a different zipper insertion method, I omitted the outer tap with button in the waist, and I omitted the leather placket on the legs, and I also didn´t include the back pockets, all of which makes my version of this pattern much easier than the original. Would you sew it again? Would you recommend it to others? As I have already made the shorts from this pattern, I think I might not use this again, but you never know? I will recommend it to others who want a pair of pants in this style! Conclusion: A well constructed pattern with lots of options for unique details! They look good Solvi. I love the rust colour and it goes well with the turquoise top. A splash of brightness for winter! They look fab! I love the rust corduroy. I especially like the seaming at the bottom– looks great with your lace up boots. 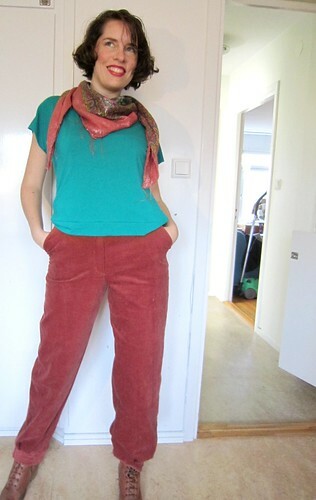 I’m going to have to try out a Burda trouser pattern. I hear people say that they are drafted well. Lovely style and colour and I really like the way your styled them with that bright shirt and cute coordinating scarf. Oooh, nice! I like how you styled them too. They seem to fit perfectly, and I love how you styled them with ankle boots and the bright top. Well done, Solvi! The look so fabulous! These are wonderful! i love the colour. They look lovely on you! I really like the rest of that outfit, too. Teal really is your color and the scarf and shoes are pretty! Kul – jag sydde de byxorna förra vintern – i vinröd manchester! They must be the most stylish pair of cords ever. The shape really suits you and they look perfect cosy winter wear. Im enjoying the fruity colour too! Great vision- totally worked.